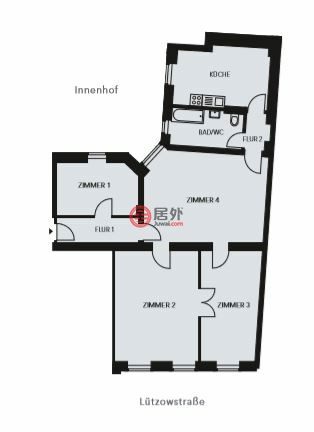 This 4 bedroom apartment is located on the 3th floor and oriented to the Lützowstraße aswell as to the quite inner courtyard. Entering the apartment there is a corridor leading into the first bedroom, which can be used as a nursery. The next room is a beautiful bright living room, which leads to two more bedrooms. From the living room another small corridor leads to the bathroom and a kitchen. The bathroom includes a bathtub. The high ceiling and well-kept floorboards underline the charm of that property. A cellar room completes the offer. This apartment is rented out, so far it can only be seen as an investment The rentability is regarded as sustainable high. A total of 18 apartments are available. We are happy to inform you about the project and the individual units in a personal conversation. If you want more information, click: www.tiergartenliving.com.